Definition at line 42 of file TypoCorrection.h. Definition at line 238 of file TypoCorrection.h. Definition at line 230 of file TypoCorrection.h. Definition at line 59 of file TypoCorrection.h. Definition at line 68 of file TypoCorrection.h. Definition at line 76 of file TypoCorrection.h. Add the given NamedDecl to the list of NamedDecls that are the declarations associated with the DeclarationName of this TypoCorrection. Definition at line 4916 of file SemaLookup.cpp. Referenced by setCorrectionDecl(), and setCorrectionDecls(). This can be used to attach external notes to the diag. Definition at line 253 of file TypoCorrection.h. Definition at line 232 of file TypoCorrection.h. Referenced by checkCorrectionVisibility(), and clang::TypoCorrectionConsumer::getNextCorrection(). Definition at line 240 of file TypoCorrection.h. Definition at line 161 of file TypoCorrection.h. Definition at line 236 of file TypoCorrection.h. Definition at line 244 of file TypoCorrection.h. Definition at line 4928 of file SemaLookup.cpp. Referenced by clang::Sema::diagnoseTypo(), getQuoted(), and setCorrectionDecls(). Definition at line 84 of file TypoCorrection.h. Definition at line 86 of file TypoCorrection.h. Referenced by clang::TypoCorrectionConsumer::getNextCorrection(), and isKeyword(). Definition at line 151 of file TypoCorrection.h. Referenced by clang::Sema::CheckQualifiedMemberReference(), clang::Sema::containsUnexpandedParameterPacks(), clang::Sema::EndOpenMPDSABlock(), findDirectBaseWithType(), getCorrectionDeclAs(), IsUsingDirectiveInToplevelContext(), and clang::FunctionCallFilterCCC::ValidateCandidate(). Definition at line 156 of file TypoCorrection.h. Referenced by clang::Sema::ActOnStartClassImplementation(), clang::Sema::ActOnStartOfObjCMethodDef(), CloneDesignatedInitExpr(), clang::Sema::FindProtocolDeclaration(), and clang::DeclFilterCCC< C >::ValidateCandidate(). Definition at line 226 of file TypoCorrection.h. Referenced by attemptRecovery(), and clang::Sema::diagnoseTypo(). Definition at line 91 of file TypoCorrection.h. Referenced by attemptRecovery(), and findDirectBaseWithType(). If Normalized is true, scale the distance down by the CharDistanceWeight to return the edit distance in terms of single-character edits. Definition at line 128 of file TypoCorrection.h. References CallbackDistanceWeight, InvalidDistance, and NormalizeEditDistance(). Definition at line 256 of file TypoCorrection.h. Get the correction declaration found by name lookup (before we looked through using shadow declarations and the like). Definition at line 146 of file TypoCorrection.h. Referenced by attemptRecovery(), clang::Sema::diagnoseTypo(), and getCorrectionDecl(). Definition at line 183 of file TypoCorrection.h. Definition at line 202 of file TypoCorrection.h. Referenced by begin(), clang::Sema::diagnoseTypo(), getExtraDiagnostics(), isKeyword(), clang::CorrectionCandidateCallback::ValidateCandidate(), and clang::FunctionCallFilterCCC::ValidateCandidate(). Definition at line 208 of file TypoCorrection.h. References getCorrectionAsIdentifierInfo(), isKeyword(), and clang::IdentifierInfo::isStr(). Definition at line 215 of file TypoCorrection.h. Definition at line 213 of file TypoCorrection.h. Referenced by clang::TypoCorrectionConsumer::getNextCorrection(), and clang::CorrectionCandidateCallback::ValidateCandidate(). Since addCorrectionDeclsand setCorrectionDecl don't allow NULL to be added to the list of the correction's NamedDecl pointers, NULL is added as the only element in the list to mark this TypoCorrection as a keyword. Definition at line 194 of file TypoCorrection.h. Definition at line 119 of file TypoCorrection.h. Referenced by clang::TypoCorrectionConsumer::getBestEditDistance(), and getEditDistance(). Returns whether this TypoCorrection has a non-empty DeclarationName. Definition at line 188 of file TypoCorrection.h. 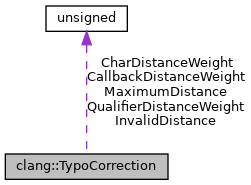 Returns whether this typo correction is correcting to a declaration that was declared in a module that has not been imported. Definition at line 248 of file TypoCorrection.h. Referenced by clang::Sema::diagnoseTypo(), and clang::TypoCorrectionConsumer::getNextCorrection(). Definition at line 112 of file TypoCorrection.h. Definition at line 166 of file TypoCorrection.h. Definition at line 172 of file TypoCorrection.h. Definition at line 219 of file TypoCorrection.h. References clang::CXXScopeSpec::getBeginLoc(), clang::DeclarationNameInfo::getSourceRange(), clang::CXXScopeSpec::isEmpty(), and clang::SourceRange::setBegin(). Definition at line 95 of file TypoCorrection.h. Definition at line 108 of file TypoCorrection.h. Definition at line 249 of file TypoCorrection.h. Definition at line 100 of file TypoCorrection.h. Definition at line 104 of file TypoCorrection.h. Definition at line 57 of file TypoCorrection.h. Definition at line 55 of file TypoCorrection.h. Definition at line 45 of file TypoCorrection.h. Referenced by getEditDistance(), isCandidateViable(), NormalizeEditDistance(), and clang::CorrectionCandidateCallback::RankCandidate(). Definition at line 49 of file TypoCorrection.h. Definition at line 56 of file TypoCorrection.h.